‘When ambitious psychopaths get control democracy goes wrong’ – a thought from author Robert Harris, whose trilogy of novels about power and ambition in Ancient Rome has been dramatized for the stage. He said when he wrote it he had “absolutely no idea the parallels with Brexit and President Trump would be so obvious”. Rome had been a Republic for centuries ruled by an intellectual elite until it was torn apart by populists whipping up the mob and within 25 years had become a dictatorship with an Emperor. 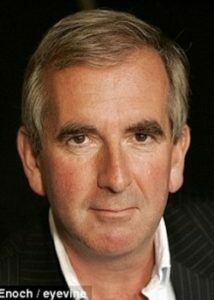 Harris was born 7 March 1957 in Nottingham into a working class family with a printer father, wanted to be a writer from an early age, went to Cambridge and worked for the BBC and newspapers as a journalist. He also wrote novels through his 20s and hit the big time with Fatherland, about a Britain after WW11 under a victorious Hitler, when he was 35. Thereafter he’s written more best-sellers on mainly political or historical subjects. He’s a Sun Pisces in a hard-working square to Saturn in thoughtful Sagittarius; with Venus Mercury in Pisces trine Neptune. What drives his extraordinary output apart from his Saturn, is an ultra-determined Mars (Moon) in Taurus square Pluto and in a confidently enthusiastic trine to Jupiter in Virgo. He does have creative talent from marked 5th and 7th Harmonics. 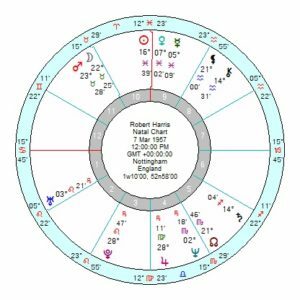 Sadly Caesar’s chart – a Sun Cancer opposition Saturn (Uranus) in Capricorn square Neptune – does have some similarities to Putin’s. They are both highly Cardinal charts with Sun, Saturn, Neptune aspects and Jupiter in Taurus. Putin’s chart is more like King Richard 111. The mob (deplorables) rising up against an out-of-touch political elite (Bullingdon Boys) doesn’t seem too much of a stretch as a parallel with Ancient Rome. Though from what Harris says he didn’t write the trilogy with that in mind. It’s all very well to sneer at him for being a journalist not a historian – and historians don’t get it wrong? – but I have immense respect for his ability to bring history (recent and ancient) to life and inform a general audience who wouldn’t otherwise be tempted to wade through original source documents. Madeleine Albright makes some cogent points about the risky place we’re in at the moment with the rise of populism and authoritarianism globally, publicising her book Fascism: A Warning. (URL below). Fascists she says often come to power through the ballot box and then undermine democracy from within; are typically masters of political theatre; feed on and inflame grievances by setting “the people” against their “enemies”; tell their supporters that there are simple fixes for complex problems; present as national saviours and conflate themselves with the state. She lists more recent examples as Chavez, Erdogan, Orban, Putin, Trump and points out it was Mussolini who first coined the Trumpian phrase “drain the swamp” – drenare la paludein. Somewhat related, seems like Davis and now Johnson “cut their veins” rather than faced the mob that would have expected if they’d had their way. This probably means no Hard Brexit, which would, of course meant Britain would have looked very much like Venezuela in matter of weeks, because these geniuses never bothered with things like ensuring British Customs worked in March. Also, an internet rumor about 4 hours ago had it May threatened Johnson with full investigation to Leave campaign finances if he didn’t agree with Soft Brexit. Seems like he knows he is screwed, anyway. I read “Fatherland” (which is set in Berlin, BTW, and chilling) when it came out, and continued with other Harris’s thrillers, but haven’t quite gotten to read the trilogy despite being a history buff too. But yes, goes to show populism sliding to totalitarianusm is nothing new. Fortunately, there are also instances of “comeback” from populism. Andrew Jackson was one off as an American President. Many Southern American countries have had encouraging development since the 1990’s. Also, for truly scary, authoritarian stuff, I’d avoid having a person with Augustus’ chart. I seriously hope Putin hasn’t or isn’t going to adopt, his daughters seem uninterested in creating a dynasty and rumored love child(ren) would likely be in their teens at the time of succession. Medvedev has been pushed back, too. There are different conversions from Roman Calenders resulting to different birthcharts for Augustus, but he would have been a Virgo Sun with either a Scorpio or Capricorn Moon. But, I think in his case the most determining feature would be Saturn/Mars/North Node conjunction in Taurus. He had a destiny, no doubt about that. Been to see Imperium at the Gielgud this week in London. The audience certainly picked up on the Trump and Brexit links with great delight. It was so obvious that those times strike a chord with our own. It doesn’t seem that Robert Harris worries about selling books. His Cicero trilogy has been out for some years and is well regarded and popular enough for this stage adaptation to transfer from Stratford to the West End. The theatre was packed by those, like me, who love the novels and wanted to see them brought to life. I don’t think the Roman Republic was ever a democracy. It was a hierarchical society where election to the Senate was restricted to a tiny privileged Roman elite and a few wealthy Italian provincials. It became destabilized when it conquered a huge Mediterranean empire relatively quickly. Imperial wealth and the strains of administering a large number of provinces caused the system of government designed for a city state to collapse. The political split between Populares (Populists) and Optimates ( the best men) was about who in the elite group was going to rule. The division started in the Second Century BCE so it predated the fall of the Repblic by at least a century. Julius Caesar was a both a Poulares and a Patrician in the true sense of the term whose main aim was to gain political power and prestige personally and for the Julii family. 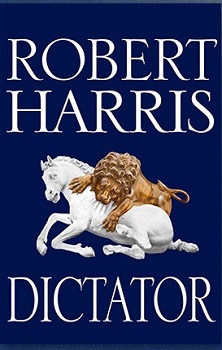 In that respect most of the parallels that Harris draws between things like the Trump Presidency and Brexit etc are largely specious but then I suppose he has books to sell! Trying to suggest that the UK referendum on the EU has any parallels in First Century BCE Rome is just ridiculous. I agree on this. While human nature does seem to be inmutated in many senses, one can’t overstate how different the late-Republican Era Roman society was from ours. I just realized I probably haven’t read Harris’ Cicero Trilogy partly because I read his “Pompeii” and was somewhat frustrated that apart from brief mentions in slavery, you could have actually transferred the characters to the 21st Century Naples and made it a “what if” thriller. I guess it would be to a Historian of Menthalities to map precisely how 1st Century BC Populism is different from the 21st Century one, but I’d say one very big difference was that in the 1st Century, there simply wasn’t an idea of all men and women being born equal. Now, populists do play on this not being the case, but most people in Western World believe this being the case at least at some level. “Putin’s chart is more like King Richard 111.” Will future generations find Putin buried under a parking lot, too? Or..a Dairy Queen? Your description of the players has me enticed to obtain a copy of the book.